Abbot Kinney Holiday Stroll and Family Fun Day This Weekend! - Yo! Venice! Home Abbot Kinney Blvd Abbot Kinney Holiday Stroll and Family Fun Day This Weekend! 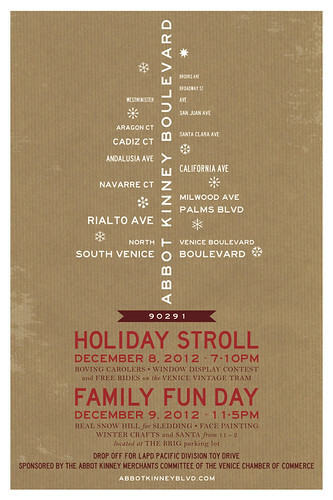 Abbot Kinney Holiday Stroll and Family Fun Day This Weekend! The Abbot Kinney Merchant Committee will host a weekend of holiday merriment on December 8th and 9th! Saturday is “adults night” with merchants remaining open until 10 pm. The Venice Historical Society will have their tram giving people rides and a steel drum band will be roaming the street. Attendees will be able to vote for “best window display”. Sunday the 9th will be the annual “family day” from 11am-5pm, with a snow hill set up in the parking lot of The Brig for kids to sled on! SANTA will be in attendance from 11am-2pm! There will also be holiday crafts, face painting, food and tram rides! Venice’s own Jingle Bell Rockers will be spreading Holiday Cheer along the Boulevard, and stores will serve refreshments! During the event, toys will be collected for the LAPD Pacific Division Toy Drive. Help out by bringing a new, unwrapped toy!